St Andrew was a fisherman called to be one of the twelve Apostles. Like his brother Peter, he was later martyred. St Giles was a holy hermit who lived in Southern France around the 8th c AD. St Lawrence was archdeacon of Rome and martyred in 258 AD by the emperor Valerian. St Michael is one of the four Archangels and led the heavenly hosts to defeat Satan. St Winifred was an Abbess in Wales and has been venerated as a saint since the 7th century. Each of our six churches has regular services and events. The Mission Community is delighted to welcome Northleigh, who joined us on an informal basis as of 1st January 2019. Please see the individual page for each church, our news page and our calendar to find out more. We took our name from the Holyford area of Colyford, which is in the middle of the whole Mission Community. Holyford woods is a local nature reserve. 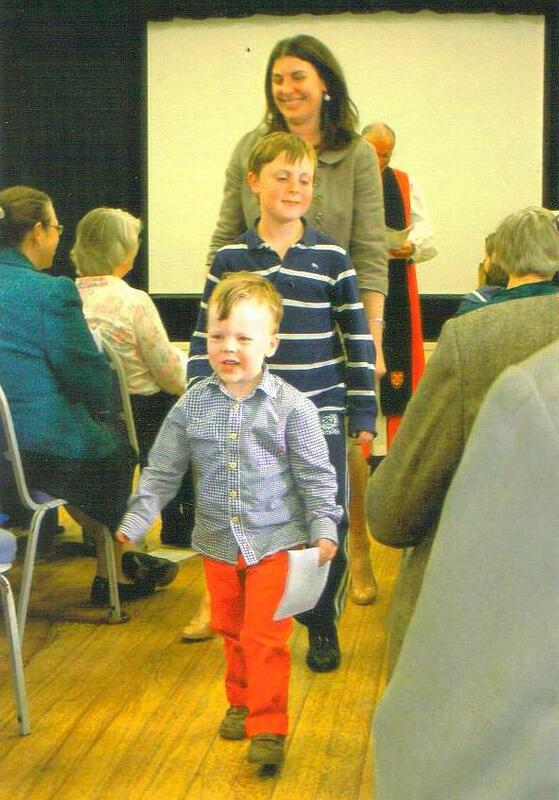 We renamed our Mission Community at a special celebration service in Colyford Memorial Hall with the Bishop of Crediton, the Rt Revd Nick McKinnel, at Pentecost, May 19th 2013. We hope that our life as a Mission Community enables each church to be a worshiping presence in every one of our local communities, whilst enabling us to do more together than we could do alone. We meet regularly to worship as a Mission Community, for social events and for courses. Much of our work with families, children and young people is also shared. Every parish has its own Parochial Church Council. We also have a Mission Community Council where ministers and representatives from all the parishes can work together. A new leaflet shows a map of our six beautiful and historic churches, with some notes about each one, and gives suggestions for walking or driving around them. The complete circuit is about 22 miles (34 kilometers). The leaflet can be downloaded here. 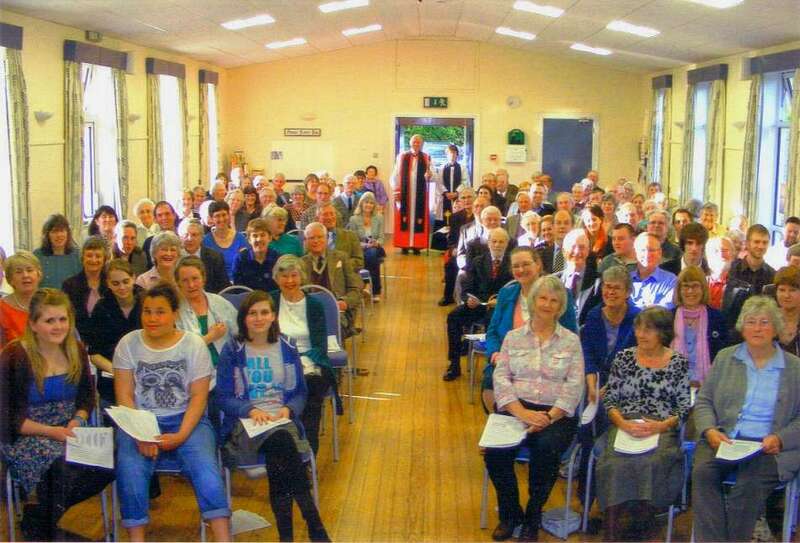 Holyford Mission Community is part of Honiton Deanery. For a map of Honiton Deanery including all the Holyford Churches, click here. 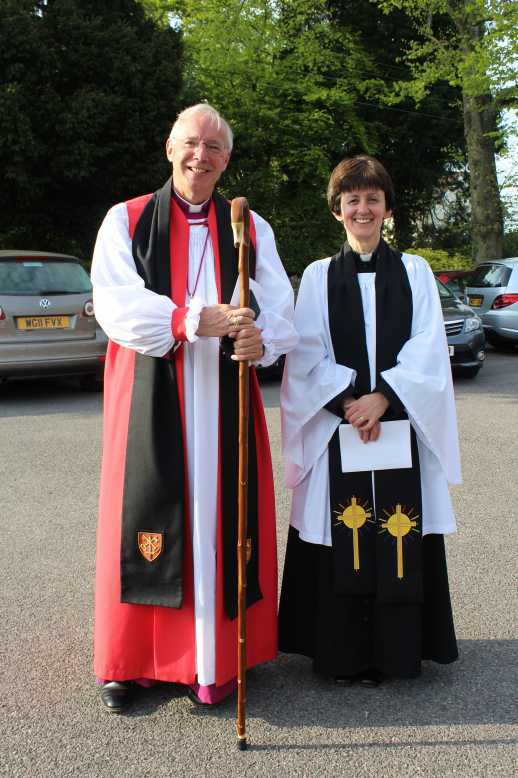 On the wider scale, we are part of Exeter Diocese, The Church of England, and the worldwide Anglican Communion. We also have a link with the Diocese of Antsiranana in the Indian Ocean. St Andrew’s Colyton has links with St Andrew’s Colyton, New Zealand. In July 2013 members of St Andrew’s Colyton were delighted to welcome churchwarden Helen Maxwell from New Zealand (pictured here with Christine Sansom) during her visit to this country. 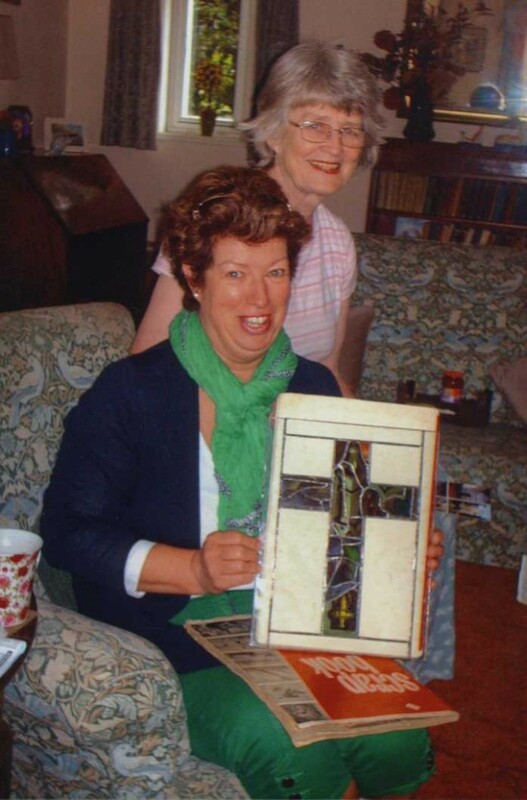 She was presented with a small cross made of stained glass from the West window, to place in the church in New Zealand.